Despite their destructive theme, tabletop wargames are full of creativity, from the professionals writing rules and sculpting miniatures through to the enthusiasts building terrain and painting figures. Whether you want to play at steam powered warfare, or just collect wild and fascinating toys, then there’s a steampunk wargame option for you. Like pop music and self-publishing, wargames miniatures are the sort of art that has often been sneered at by high-brow culture. But the existence of the Beatles and Hugh Howie show just how misguided that sneering can be. As Patrick Stuart has argued on HiLoBrow, wargames miniatures are a form of pop sculpture, and one that allows more engagement by the audience than traditional sculpture. These tiny statues are designed to be modified, for you to change them through painting or conversion, to feel them in your hand, to play with them. The best are things of incredible artistry, especially in their tiny details, and they invite you to join in the creation, not just to stand and stare. Boy is there a lot to stand and stare at. Infamy Miniatures have a growing range of steampunk figures, punking up everyone from Nikola Tesla to a monstrous Mr Hyde, with a gun-toting Oscar Wylde on the way. Demented Games have a wheeled version of Dickens’s Dodger. Artizan Designs have masked and sinister policemen. Games Workshop have several steampunk figures in their fantasy range, including the dwarf gyrocopter and the spectacular Empire Steam Tank. If you want to collect tiny steampunk statues, then miniatures manufacturers have you covered. Just follow a few links, pick something you like, and start collecting. What about the games themselves? The most popular steampunk wargame is Privateer Press’s Warmachine. Set in the steampunk fantasy world of the Iron Kingdoms, its armies centre around massive steampowered war robots guided by magical warcasters. You can play as a Soviet-style empire, religious fanatics, or even piratical freebooters, each with their own distinct steampunky aesthetic. For someone new to wargaming, Warmachine has two big advantages. It scales well, letting you start out small, and there are lots of players so you can find someone to learn with – just ask at your local gaming shop or on Privateer Press’s online forums. The downside of Warmachine is that its rules are built around a particular brand of miniatures. If you want to collect a wide range of steampunk soldiers then there are plenty of other options. Military history publishers Osprey have a set of steampunk rules designed for small scale skirmishes – again ideal for a beginner. I’ll give you three answers. The first is that you might not want to bother. After all, you could be working on your costume. But you were interested enough to read this far, so hopefully that answer isn’t the one you’re after. The second reason is the one that applies to anything steampunky – because you can never have too much steampunk. And with wargames miniatures taking up so little space, why not fit a few into your life? But the real reason is the third one – because wargames, like all the best steampunk activities, let you be creative. They let you take things that are already in the world and turn them into cooler things. Maybe you’ll buy an awesome miniature and make it even more awesome by painting it in your favourite colour scheme. Maybe you’ll buy an OK figure and make it amazing by adding extra bits, converting it into a model of you in your steampunk costume. Maybe you’ll gather up a bunch of old gears and bits of wood to build a miniature steampunk factory to fight over. Wargaming opens up all these creative possibilities, and then gives you a way to play with your newly made toys. Because it might look destructive, but wargaming is an incredibly creative hobby, and another great way to get your steampunk on. Want to read more? Check out Part 1 and Part 2 of the Steampunk gaming series! So much of steampunk is about taking on the role of a different person. Inventing a name, a history, a costume, even a whole new personality. If you want to take things further, to live out that character’s life and undertake their adventures, then maybe it’s time to go one step further. Maybe it’s time to try a steampunk roleplay game. Tabletop roleplay games (RPGs) have two big advantages over the computer versions. One is that they’re more social – you can play with a group of friends, rather than losing yourself alone in the glow of a screen. Secondly, they let you play characters you invent, rather than the ones the computer program designers have created for their story. This gives you more freedom, more flexibility, and the chance to play out the life of your very own steampunk character. Fundamentally, you need only a few things to play. First, a group of friends. Second, a volunteer from that group who will run the game. They’ll describe the world, craft the adventure and play the people the heroes meet along the way. Third, a rule system, and whatever accoutrements it requires. And lastly somewhere to sit and play. Many of the best games are simple to play and come with their own world for you to explore. Lynne Hardy’s Cogs, Cakes and Swordsticks is perfect for a steampunk occasion. Set in the Empire of Steam, a version of the Victorian age full of marvellous inventions and top-notch afternoon tea, it’s simple to play and doesn’t need lots of equipment, meaning you can play in your favourite teashop, or coffee house should there be no such hostelry in your area. If you’d like something with more rules or a fantasy feel then Privateer Press’s Iron Kingdoms transports you to the same setting as their steampunk fantasy wargames. Years of development mean that there’s a rich pre-made world to explore, and the high fantasy setting lets you play as anything from a powerful magical warrior to the controller of a steam-powered robot, living a life of action and adventure. There are as many settings as there are games, from the weird west of Deadlands to the steampunk colonialism of the classic Space 1889, so you can pick a flavour of world that suits you. Alternatively, many steampunks prefer to roleplay in their own invented worlds, or to invent those worlds and then invite their friends to come and explore. To do this you can take a specific game and strip away the setting, adapting any rules that don’t suit your needs. It’s a very steampunk approach, tinkering with the mechanics of a game. There are also games designed for you to create your own worlds. Savage Worlds is well suited to pulpy action adventures. It has simple mechanics and characters can be created quickly to let you get started. It’s designed for action adventures, and to be used in many different settings, so if you want your characters to face lots of fights and chases it could be perfect. If you want something more sophisticated, or less dominated by combat, then Steve Jackson Games’ GURPS (Generic Universal RolePlaying System) remains the benchmark for an adaptable system. As well as the core rules there are several supplementary books providing ideas and rules specifically for steampunk games, giving you a huge variety of options to choose from. Another generic game, Microscope offers a whole different way of playing. This is a roleplay game in which you invent the world as you go along, playing out scenes from its history, deciding what the great events are. You could explore the history of an alternate Victorian age, or spend time developing a steampunk empire that lasted a thousand years. Anything goes, you don’t even need dice, and it lets everybody share in the worldbuilding. If you really want to live your character’s life then you could go full-on and try live action roleplay (LARP), in which you not only imagine your character’s life but dress up and act out their adventures. LARP is run by local groups getting together and creating their own games, so if that interests you then search for a group in your area, or see if there’s a game in the schedule at a nearby convention. It’s a lot of fun, but a lot more effort than sitting playing at a table. So what are you waiting for? Go grab a character sheet and a nice cup of tea – it’s adventure time! Want to read more in this series? Check out Part 1 and Part 3! Steampunk and board games have a lot in common. They’ve both taken off enormously as subcultures in the past twenty years. They’re both slightly outside mainstream awareness in English-speaking countries. They both have dedicated fan bases, people who will travel hundreds of miles or even to different countries to indulge in whole days dedicated to their hobbies. And of course there are the steampunk board games. Let’s Stick Some Gears On It! It’s fairly easy to give a board game a little bit of steampunk flavour. Forbidden Desert by designer Matt Leacock is a great cooperative game in which you dodge sandstorms and try not to die of dehydration while you rebuild your ruined airship. It’s only a little steampunk – that airship could as easily have been a helicopter like the one used in its predecessor Forbidden Island. Yet that eccentric looking airship, that touch of gears and steam, does make the game more satisfying, as you slot together the parts of this tiny plastic toy on your way to victory or defeat. Or look at Mission: Red Planet by Bruno Cathala and Bruno Faidutti. A game about mining Mars could as easily have had a science fiction setting as a steampunk one, but the eccentricity of that steampunk setting makes it more interesting and evocative. I’d rather play an eccentric Victorian industrialist digging up the red planet than a game that tries for the realism of Andy Weir’s The Martian – wouldn’t you? A touch of steampunk can help a board game to stand out in a crowded market. But there’s also a deeper connection at work here. Pause for a moment and think about what’s similar between steampunk and board games. Now you’ve probably guessed what I’m about to say – that both steampunk and board games are great ways of letting us be creative, while taking control of a corner of our lives. Nigel Pyne’s Oddball Aeronauts, a simple fantasy card game with more than a little steampunk flavour, illustrates this beautifully – not least through its beautiful illustrations. A handful of cards lets you take control of an airship in a desperate dogfight. Will you try to board the enemy, or attempt to outfly them before loading your guns? Will you use your Cannoneers, your Marksmen or your explosive Fuse Bots? And what’s with those bulbous bits on the bottom of the pirate airship – the view from their must be fantastic! Like steampunk, most board games encourage you to imagine yourself in another world, one full of strange sights and amazing characters. As well as evoking something entertaining they give us control of parts of our lives, whether through costume making, story writing or plotting a strategy for the board. We’re free to find excitement and make important choices without risking real consequences. That’s wonderful and liberating. Of course, the same could be said about a game like Reiner Knizia’s Modern Art that, fantastic as it is, is firmly anchored in the real world. 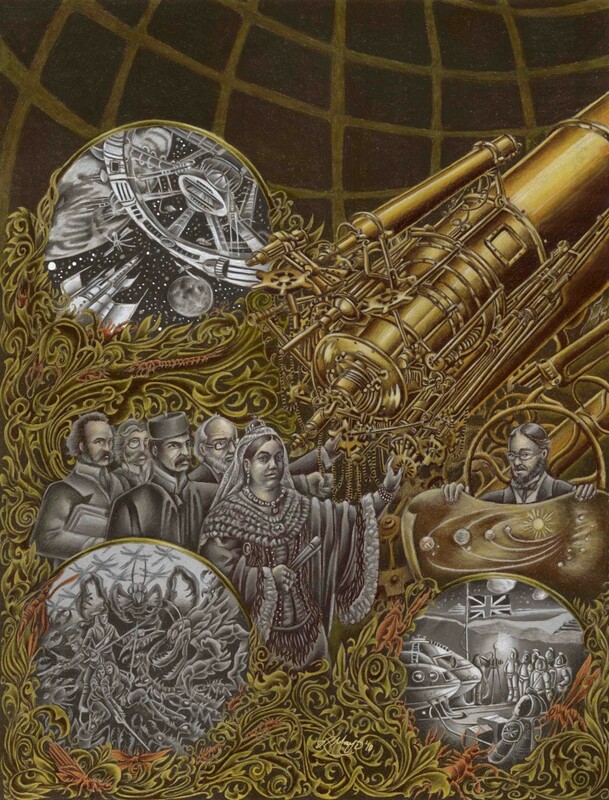 But the best steampunk games connect theme and mechanics, evoking a core aspect of steampunk in a way few others things can. Many of the most popular board games are those known as Eurogames. Influenced by Germany’s huge gaming culture, designers like Reiner Knizia and Klaus Teuber use ingenious rules that encourage players to construct systems within the game. Whether you’re creating a kingdom, running a factory or establishing a trade network, success in these games comes from taking different game elements and connecting neatly together. In effect, you’re building a machine. And again, if you know anything about steampunk, you can probably predict where I’m going with this. Great games connect their theme and mechanics, so that the rules evoke the atmosphere. The tense, careful building of poker hands in weird western card game Doomtown: Reloaded (which also features its share of steampunk mad scientists) evokes a Wild West shootout in a way that rolling dice never could. In the same way, the building up of moving parts in a Eurogame perfectly evokes the inventiveness and machinery that are central to steampunk. This is what a game like Alex Churchill’s upcoming Steam Works does. Not only are you playing the role of steampunk inventors, but you’re doing it by connecting together the game’s components as you put together the components of your machines. Can you think of a more perfect way of evoking mad science and oddball invention, short of building your own tesla coils? There are also options if you’d prefer to play with a pre-built machine. The World of Smog: On Her Majesty’s Service, by Yohan Lemonnier, has dials and gears on the board that turn as part of the game. It’s a game whose very board evokes a machine in motion. If you’re not already a gamer but you want to start – and I heartily recommend that you do – then your best bet is to pick something simple and straightforward. Oddball Aeronauts has a reputation as being accessible as well as fun. Smash Up: Awesome Level 9000 is only 1/4 steampunk, but it’s a lot of fun, and if you like it then you can mix it in with the original game and its other variants. Forbidden Desert is straightforward and an interesting challenge, and has the advantage of being cooperative, making it easier to work out how to play as a group. And if none of those appeal, or you just want to look for more options, then check out the steampunk game list on Board Game Geek, the internet’s single best repository of board games information and discussions. Because what could be more perfect than a bit of steampunk where the gears really do turn? Want to read more in this series? Check out Part 2 and Part 3! Andrew Knighton is a steampunk author and freelance writer. 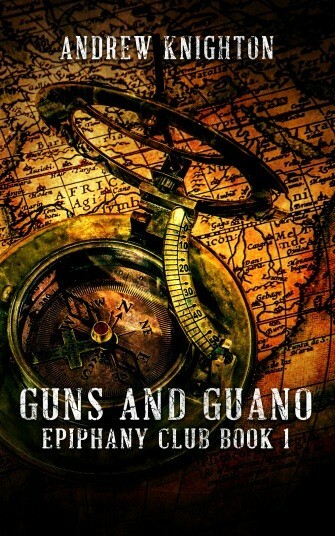 The first book in his Epiphany Club series is available for free on Amazon Kindle. He blogs about board games for Boardgameprices.com, and about all things steampunk, science fiction and fantasy at Andrew Knighton Writes. 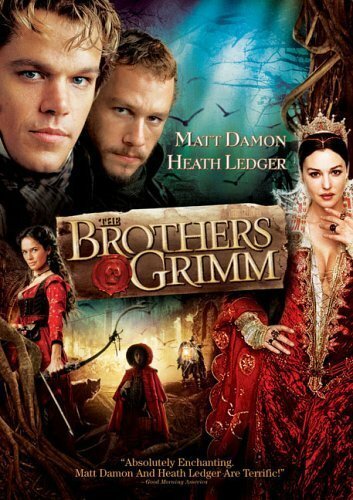 One of my most popular posts is my review of The Brothers Grimm movie with Matt Damon and Heath Ledger. The original book of stories, Children’s and Household Tales, was published in 1812, and its English translation was read in nurseries during the Victorian period. This is one of my favorite movies of all time, so I have watched it many times with many different people. Across these viewings, a drinking game has emerged according to the references to the Grimm’s fairy tale collection. There a few instances of fairy tale-like phrases and characters that I haven’t been able to find a basis for in the Grimm’s book, so below is a guide both for people who want to play the game or who just want to know what the movie is referencing. 1. Fairy tale numbers: The numbers 3 (as in 3 wishes), 7 (dwarves) and 12 (dancing princesses) often occur in fairy tales. This film uses 3 and 12 more than once, so each time one of these numbers is mentioned, take a swig. 2. Phrases: Things like “Once upon a time” and “happily ever after” have become synonymous with fairy tales. Other recognizable tropes are “the fairest of them all,” “true love’s kiss,” and “Mirror, Mirror on the wall.” So any time you hear these types of phrases that ring a bell from a childhood tale, swallow away. 3. 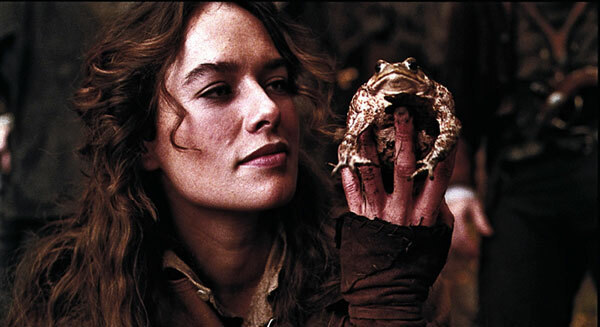 Direct references: There are tons of verbal and visual references to classic fairy tales throughout the film as well. The writers combine several tales into single characters, so there may be several times to drink stacked on top of each other. These are the ones that I have been able to confirm using a translation of the original text. The Goose Girl- the peasants of Marbaden can occasionally be seen herding geese in the film. Red herrings: There are other fairy tale references that you will recognize, but they were NOT in the original Grimm’s collection. It is up to you if you want to play the game with or without these. Bridge Troll (3 Billy Goats Gruff)- This is a Norse tale, first recorded in 1841. Horse infected by spiders- There is a terrifying scene where an enchanted horse swallows a little girl with the aid of the spiders who infected it earlier. Though compelling and in the spirit of the dark tales, I couldn’t find any basis for this in Grimm’s collection. The Gingerbread Man- in the film, one of the girls is encased in mud and takes the form of a gingerbread man. This story was not published until 1875, so post-dates the Grimm’s collection. The Princess and the Pea- In the film, the evil queen is sleeping on a thick stack of mattresses. But, this is a Danish story recorded for the first time by Hans Christian Andersen in 1835. “Huff and puff”- Though there are two “big bad wolves” in the Grimm collection, they don’t blow anything down. Ravens as minions- There is a tale in the Grimm collection of seven brothers who are turned into ravens, but in the film the evil queen employs them as spies and to carry someone up to the tower window. Ravens were the minions of Odin in Norse mythology, but are not used this way in the German collection of stories. Did I miss something? Leave a comment below! In my experience, Steampunk literature, movies and games fall along a series of spectra. Some stories tend more towards science fiction, with an emphasis on the technology of the time, while others focus on the world of the supernatural with its ghosts, vampires and other things that go bump in the night. 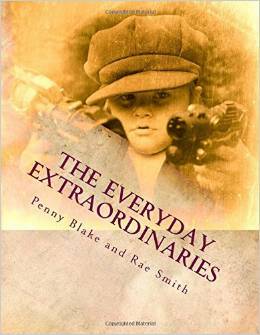 Then there is the range of serious, like Whitechapel Gods, to the silly and fun, like Rae Smith and Penny Blake’s new release, The Everyday Extraordinaries: Extraordinary Adventures for Ladies and Gentlemen. This live action role play (LARP) project has deep roots. Penny has been writing about the whimsical, alternative reality of “New World” for a long time before the larping book became available in September. It all started with Ashton’s Kingdom, which is a graphic novel series that is currently getting illustrated, and The Everyday Extraordinaries blog grew out of it. On that site you can explore the ins and outs of the “Universal Fruitcake Theory” and the benefits of “Cream Power.” In this land, disputes are settled by flinging cake and tea duelling, often with hilarious results. Even though the title has “everyday” in it, players are encouraged to be extraordinary in a way that fits their schedule. Full-scale larping with friends, or just taking a few minutes to think about adventure is enough to join the rank of the Extraordinaries. The book has beautiful photos of different character types to help you create a persona to fit into the universe, including the Airship Captain, Resourceful Urchin, The Relentless Rogue and the Quiet Scholar. This game is designed to played by like-minded friends as well as being family-friendly to encourage Steampunks of all ages to engage with the content and 10 unique adventure “hooks.” You can decide if you are a law-abiding member of society, a neutral inventor-type or a sky pirate, it is all up to you! To learn more, check out the website or preview the book on Amazon. I am pretty new to this whole RPG (role playing game) scene, but creator Terry Sofian was kind enough to share the games that he and a group of collaborators designed. The first in the “Hive Queen and Country” series is called Stars of Empire and was released in 2011, with a new edition currently in the works. It is a “d-20” game, meaning that players use 20-sided dice to decide their fates during game play, and characters grow and change with each adventure. Intrigued? Well wait, there’s more! Within a few decades of leaving Earth’s atmosphere, humans have visited the moon (Luna), Mars and Venus. Luna in this scenario resembles First Men in the Moon, where the hollow body houses a network of tunnels. But unlike the Wells’ story, Luna has been abandoned by its inhabitants. The most troubling discovery is there also appear to be human burials on its surface, and no one knows how they got there. I don’t want to give too much away, but let’s just say that Mars and Venus are not quite so empty. The same care and detail are given to describing the back-story of the alien races as to their Earthly counterparts, and gives another whole dimension to the types of adventures that can be crafted within this world. So far, I have only read Stars of Empire and it is not for the faint of heart. At almost 300 pages, this is not a game that casual players will be able to pick up and learn in a single evening. But, if you enjoy d-20 games and are looking for a Steampunk world to immerse yourself in, I would definitely check out this title. There are tons of creatures, settings and characters available to create interesting scenarios and keep you engaged. The tone is realistic and the story has gravitas, so be prepared to assemble a group of serious gamers to play with. In the RPG, Sofian notes that the game can also be played with miniatures to enhance the look, and makes recommendations on the website about where to find suitable aliens and vehicles. Stars of Empire is the first in the series and uses a timeline that ends in 1893, but subsequent books move the timeline forward through the first and second “Hive Wars,” as well as conflicts on Venus. The book includes stunning artwork by several artists including Rachel Mayo and Paul Daly. You can find all of Sofian’s RPGs in a digital format at RPGnow.com, and Stars of Empire can be purchased in print from Amazon. Do you enjoy tabletop RPG’s? Have you ever played anything in the Hive Queen and Country universe? Please comment below!